AppWarp support for Android and iOS build from Unity Free! We’ve just released the latest release of our AppWarp Unity SDK which removes the requirement of Unity Pro when building multiplayer games for iOS and Android! This is exciting news as earlier developers required Unity Pro when using AppWarp and targeting builds for iOS and Android. The reason for this requirement was that the AppWarp SDK uses .Net sockets to communicate with the server. However the use .Net sockets is restricted on Unity Free builds for iOS and Android and a Pro license was required to use this. In this SDK update, we’ve added a new asset, AppWarpUnityMobile.dll, that doesn’t rely on .Net sockets. It instead uses native socket plugins (using C BSD socket API ) that we’ve written and included as part of the SDK. The two plugins are found in the Plugins directory of the SDK. Since this SDK update is free, there is now no up-front cost to developers to get started with Unity and AppWarp. To use these, you simply need to import the AppWarpUnityMobile.dll as an asset in to your project. Also add the Plugins folder “as is” to your assets. It contains plugins for Android and iOS and when you build for iOS or Android, Unity will automatically pick the correct one for you. There should be a libIosNativeSocket.a file under iOS and libsocket_android.so under Android in the Plugins directory. We’ve also pushed an iOS/Android Unity sample which utilizes the new SDK to our git repository here. The sample extends Unity 3rd person MMO controller and is essentially the same as the PC/Mac sample explained in detail here. The difference being the use of the new SDK and accelerometer for moving the Viking. There is no impact on existing Unity Pro users. You can of course continue to use the PC/Mac SDK asset (AppWarpUnity.dll) and build for iOS/Android. 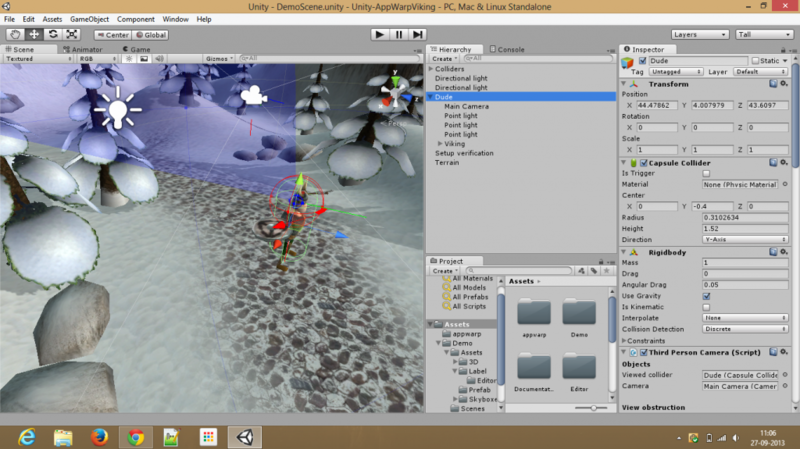 If you’re interested in learning more about how mobile plugins work in Unity, you can read on the Unity website. Info on iOS Plugins can be found here. Info on Android Plugins can be found here. I am an architect at Shephertz Technologies. I am currently leading the development of ShepHertz cloud gaming offerings.